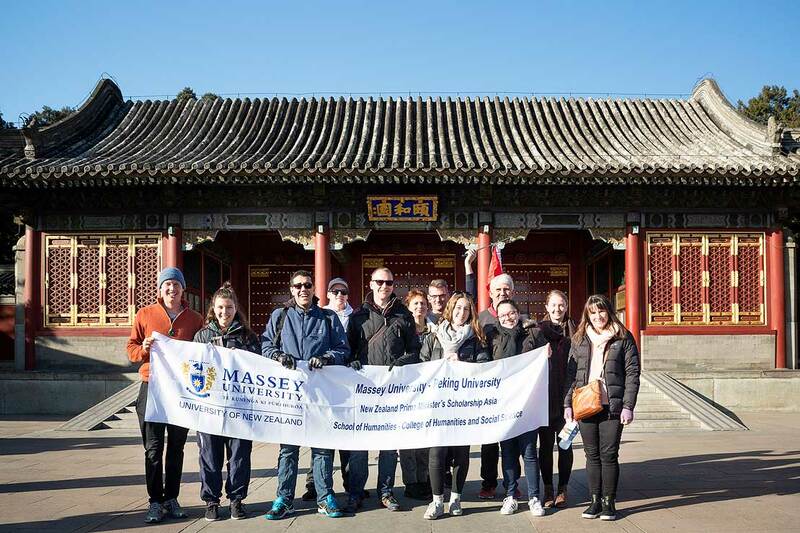 A six-week study trip to China funded by a Prime Minister’s Scholarship to Asia (PMSA) has given 15 Massey students a deeper appreciation that learning Mandarin is a ticket to greater cultural understanding and job opportunities in the future. Several in the group, including a lawyer, a photographer and a finance banker, have shared their personal experiences in a video. All agree their Chinese language skills improved markedly through the immersion experience involving language classes at the prestigious Peking University (PKU), as well as field trips, cultural excursions and meeting locals during the trip last November to December. The scholarship, worth $112k, was awarded to the School of Humanities’ Chinese language programme, led by Dr Michael Li at the Auckland campus. He accompanied the group of mostly distance students, including some part-time students enrolled in a Humanities 200-level Special Topics course, themed around language, culture and industrial experience to count as an elective credit towards their degree study. 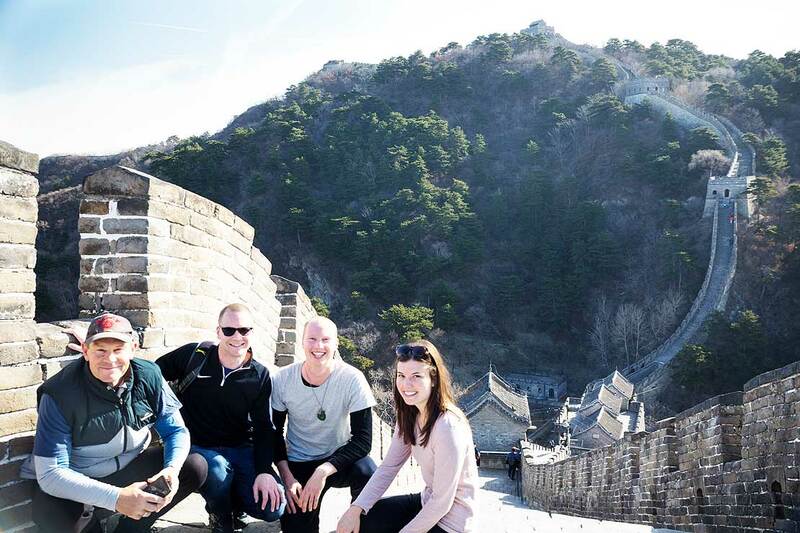 Massey Chinese language students (from left) Llorne Howell, Tim Cammell, Dillon Anderson and Kate Parkinson visiting the Great Wall of China. Dr Li says there is a need for more New Zealanders to communicate and understand China in a cultural context due to the growth in trade and business connections between the two countries. “Stronger cultural, language and linguistic ties – ties that sow the seeds for long-term trade and collaborative opportunities between New Zealanders and Chinese – need to be established through language and cultural exchange and business experiences,” Dr Li says. The students’ programme included classes in the School of Chinese as a Second Language at Peking University, as well as cultural activities and field trips to the Great Wall of China, a tour of the Forbidden City and Olympic Centre in Beijing, Tiananmen Square, the Summer and Winter Palaces, as well as visits to Chinese dairy group Sanyuan Dairy factory and China Hi-Tech Group, which is involved in the provision of educational technology. Associate Professor Kerry Taylor, head of the School of Humanities, says that for many decades, Massey has recognised the importance of establishing academic and commercial partnerships with key countries in Asia, particularly in the Agriculture and Environment area. In the last few years, the Institute of Agriculture and Environment of Massey has established collaborative relations with two Chinese universities – Shanghai Jiaotong University and Lanzhou University in Western China – through the New Zealand-China Tripartite Fund. In 2015, a humanities perspective was added. The School of Humanities has also taken up a three-year commitment to teach a New Zealand history and culture paper at Peking University, and has engaged actively with its New Zealand Centre. In addition, the School has hosted two visiting Peking University professors, while three Massey staff have taken up research fellowships at Peking University. “The PMSA group is another important element on growing mutually beneficial links between New Zealand and China, and part of our ongoing engagement with PKU, which is generally regarded as the top university in China,” Dr Taylor says. New Zealand statistics indicate that the trade with China has nearly tripled over the past decade, with two-way trade rising from $8.2b in the year ended June 2007 to $23b by June 2016. Annual exports to China have quadrupled while annual imports from China have doubled since June 2007.